If you’re caring for aging parents or another senior loved one, it’s only natural to worry about them when you’re not around. What if they forget their medication or take the wrong dosage? What if they fall and there’s no one around to help? These are legitimate concerns, but technology can help put your mind at ease. If you ever needed an 8-year-old show you how to do something on your smartphone, you know that navigating the world of technology doesn’t always come easily. However, setting your loved one up with a few smart tech applications doesn’t have to be overwhelming for you or for them. A smart home hub, like Amazon Echo (Alexa) or Google Home, can manage many devices. Many smart products are easy to control using simple voice commands, so they won’t have to worry about learning how to navigate around a bunch of new apps. Looking for products that are compatible with a smart home hub can simplify things significantly. Once you start searching, you’ll find many smart products that can help your senior loved one continue to live safely and independently. Here are a few to get you started. Many seniors are trying to keep track of a complicated regimen of medication. Even the sharpest mind can occasionally get schedules and dosages a little mixed up. When it comes to medication, though, missing a dose or taking the wrong pill can lead to serious complications. Instead of worrying constantly or calling all the time to make sure your loved one is following their prescribed routine, why not let technology lend a hand? There are several choices when it comes to medication management. One is to use an app on your smartphone. Medisafe is a popular free app that’s available for iOS and Android users. It gives a reminder when it’s time to take medication. 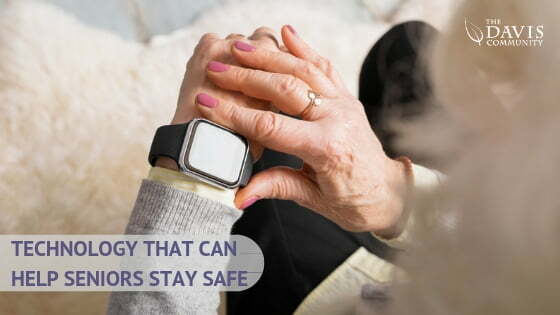 It can also notify caregivers when their loved one misses a dose. You could also try a smart pillbox, such as the Tabtime Vibe Vibrating Pill Timer Reminder. It’s small enough to fit in your pocket, and it contains five compartments that can be programmed to vibrate when you choose. Reminder Rosie is a clock that can help your loved one remember to take medications. You can record reminders for anything from doctor’s appointments to feeding the cat. Simply record up to 25 reminders, and Reminder Rosie takes care of the rest. Many seniors and their loved ones find peace of mind when they use a Personal Emergency Response System (PERS). The user wears that can communicate an emergency signal with a touch of a button. They’re simple to use. That way, even if they can’t reach the phone, they are still able to reach out for help. BioSensics offers a system that can link with a smartphone. In addition to the emergency button, it also offers fall detection and activity monitoring. Many home sensors or security systems, such as Alarm.com, can monitor ongoing activities. Depending on the system you use, you could install monitors on items like doors, beds, or even the refrigerator. This way if there’s a change in your loved one’s daily movements that could be a sign of illness or depression you’ll be alerted early. Adequate lighting is a huge factor in preventing a fall. If your loved one has to navigate a dark room to get to a lamp or a light switch they could be putting themselves in a dangerous position. Smart lights can be turned on simply using a smartphone or voice commands, so there’s no groping around searching for a switch. It is easy to connect these lights to the Amazon Echo or Google Home. Also, connecting lights to a motion detector is another way to ensure that your loved one always has the light they need when they’re walking around the house. Forgetting to turn off the stove is easy for anyone to do and can lead to tragic results. Many seniors enjoy cooking for themselves or for their friends and loved ones. A smart stove shut off is an easy way to ensure their safety and everyone’s peace of mind. There are a number of smart stove devices available. They use timers, motion detectors, or input from a smoke detector to determine when a stove is unattended. Then they will either shut off the stove, send an alert to a smartphone, or both. If staying at home is a priority for your loved one, technology could help them to continue living the life they’re used to. Using technology for senior safety can delay the need to sacrifice independence for the sake of your loved one’s well-being. If you or a loved one are in need of help living a safe, active and independent lifestyle, call the Davis Community today at 910-686-7195 or simply complete and submit our online information request form. We provide exceptional assisted living and skilled nursing services in Wilmington, NC. We offer a strong and supportive environment where your loved one will feel welcomed and part of an active community. Davis Community is pleased to offer customized concierge home care services, including meal preparation and nutritional guidance, to independent seniors living in Landfall, Cambridge Village, Wrightsville Beach and Porter’s Neck, NC. Get to know the difference today — schedule a visit to the Davis Community! This entry was posted in Senior Tips. Bookmark the permalink.